The mother of all components. The computer motherboard, also known as the main board. Some even refer to it as "mobo". People don't give much thought to the motherboard when buying a computer. They will spend most of their time and money deciding on a processor or memory rather than a motherboard. What is a motherboard or main board? I call the computer motherboard the mother of all computer components. Why? Because some crucial computer components slots into the motherboard. Components like the processor, memory and adapters slots into the motherboard. The computer motherboard also holds some crucial components that's needed for the operation of your PC. It also contains connections for other peripherals. The motherboard is actually a very important component and spending some time to research the different options will save you a lot of trouble later on. Don't skimp on this component. The modern motherboard has most functionality integrated in the motherboard. This means that the graphics, sound, USB (Universal Serial Bus) ports, and Ethernet ports are all integrated into the motherboard. With earlier computer motherboards, you had to buy these separately as add in cards or adapters that slotted into ISA(Industry Standard Architecture) or PCI (Peripheral Component Interconnect) slots. 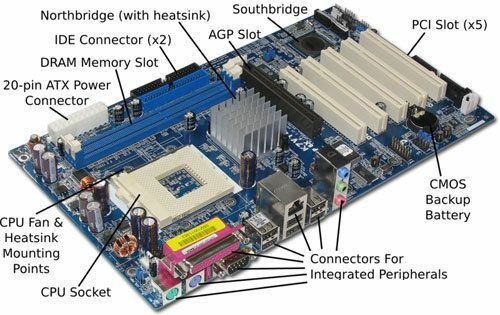 The motherboard has chips called bridges that connects the CPU and memory with the IO(Input Output) like disks, and PCI slots. They are called North and South bridges. The north bridge is also referred to as the FSB or Front Side Bus. So, the CPU, memory and if present, the AGP graphics slot, all connect via the north bridge. 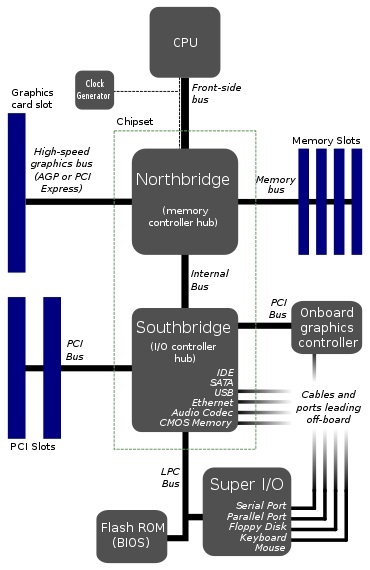 The south bridge connects the IO, like your PCI slots, on board graphics, serial port, parallel port, keyboard and mouse to the north bridge. So all components can speak to each other. Below is a logical diagram of the computer motherboard. The form factor of the motherboard refers to the shape and size of your motherboard. In the past there were different form factors but recently the industry settled on the ATX or Advanced Technology Extended form factor. Most vendors base their form factors on this standard. ATX also comes in different sub categories, but most PC's will use the standard ATX form factor. Even vendors who make servers use the standard ATX format. Vendors take the ATX standard and change it slightly so as to fit the motherboard in their servers. That's why there is so many ATX standards. The rack mount server is a great example of this. The industry basically designed the ATX form factor so building features into the motherboard was easier and mounting the motherboard into the computer case was less troublesome. The ATX form factor also allowed for smaller cases and easier installation. How do I use my motherboard? Firstly, let's discuss where the motherboard goes. It's mounted inside a computer case. You use various screws and mounting pins to secure it to the case. you then mount your CPU and memory in their slots. You also need to connect the power cables from the power supply. At the back of the case you will find most of your ports. Ports connects peripherals like your keyboard, mouse and screen. You can also connect external storage devices like usb memory sticks and so on. As you can see from the above picture, this motherboard has just about everything you need on board. From graphics ports, sound chip and ethernet ports. Other main boards might have only the essentials and you have to buy the rest yourself. This also depends on what you want to use the PC for. If you want to play high intensive graphics games then you would buy a board with no on board graphics and buy the graphics card separately. If you are a musician then you would not worry about the on board sound chip and would rather spend more money on a good external sound card. Check the specifications of the motherboard before you buy. Ask the sales guy if you can look at the specifications. If you buy a complete system then ask for the specs or go on the internet and download the motherboard manual. I also say, know what you buy. Again, this depends on what you want to use the PC for. The best advise I can give you is to look at the specs. If you're not interested in buying extra cards and adapters, then look for a motherboard that has everything on board. Just remember that this board will be more expensive, cause all components are integrated in the motherboard. If you are interested in gaming then you would definitely want a good add on graphics card. This is only an extract of the manual but just look at all the info you can get. It's an old motherboard, but it's for illustration purposes only. 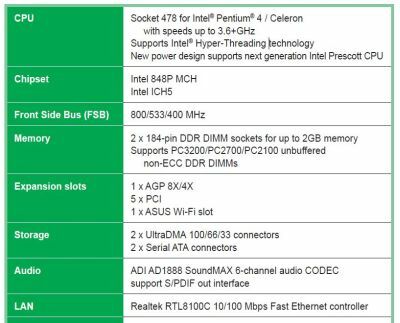 First off all I can see exactly what CPU's are supported and their speeds the sockets and so on. It also shows me the FSB speed. With this info I can choose the correct memory speeds. It show the slots and what is supported. This motherboard has one AGP slot and 5 PCI slots. So when I buy a graphics card it must be AGP. There also SATA ports and IDE, on board audio and LAN adapter. Use the manual, it will help you.